The rustic Waurika Dining Room Collection by Ashley Furniture will be a nice addition to your home. Constructed of select mango veneers and hardwood solids in a rich medium brown finish, these pieces add a subtle tropical flair to the clean lines. Rectangular table tops feature two removable 12.75-inch leaves that can be added to one or both ends. Thick table tops complement the X-style table bases on both the regular height table and counter height table. Perfect for larger groups, tables seat six diners without leaves, eight diners with one leaf, or up to 10 diners with both leaves. Coordinating side chairs and bar stools feature durable brown upholstery with a suede-look and X-backs. The X-motif continues on the server with a center wine rack. Create an ideal dining setting for any large room with the Waurika Collection by Ashley. Made with select Mango veneers and hardwood solids. Rich medium brown finish with rustic appearance. Thick built up table tops. Unique “X” base table design with matching chair backs. Also, don’t forget to check our Top 10 Dining Room Collections at FurniturePick’s easy and convenient navigation gallery. FurniturePick is an authorized retailer, dealer, and distributor of the finest home furniture manufacturers. Each brand we sell shares our philosophy of offering quality furnishings at an outstanding value. Today we are introducing exciting and innovative furniture manufacturer – Standard Furniture. Standard Furniture is one of the largest manufactures in the United States, which offers product categories including bedroom, dining room, occasional tables, entertainment and youth. Their product line is continuously updating as new trends occur and consumer preferences change, launching about 25 to 40 new product groups a year. Above all, they have a healthy mix of price points to suit any budget without compromising the quality. Craft a beautiful bedroom with the Fall River Collection. Featuring warm tones, a rich finish, and a touch of romance, Fall River takes your home decor to the next level. Crafted from wood products and metal, Fall River features v-groove construction and a dark big river cherry finish. The Parisian Dining Room Set has the glamorous look of a chic Paris salon with its sophisticated modern styling and luxurious materials. Upscale design features include crisp angled lines and a unique combination of smoked mirror panels, glossy black surfaces and black chrome hardware. 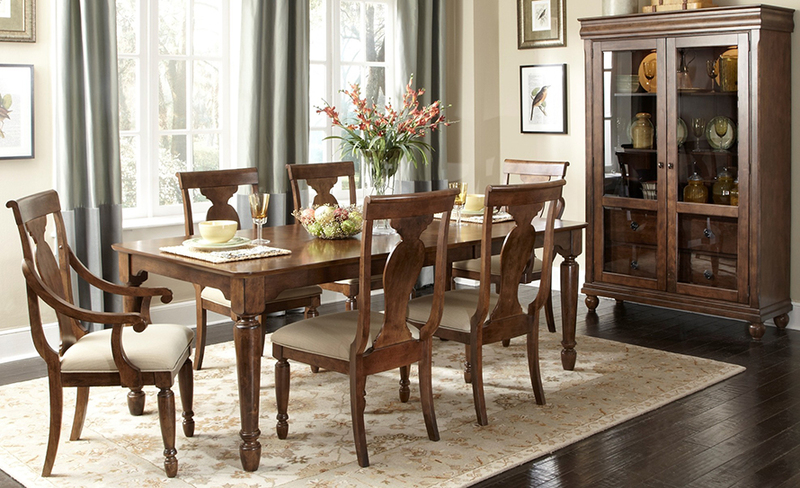 The Woodmont Dining Room Collection features graceful and soft shaping in a clean urban style. Striking lattice accents on chair backs are perfect for today’s modern home. Clean smart design lines give Fantasia Bedroom Collection versatility, allowing them to blend with any bedroom decor. Renovate your home with Standard Furniture by shopping online at FurniturePick. We will make sure that your order is processed quickly and easily with the best prices available. The Naomi Dining Room Collection by Ashley Furniture at FurniturePick combines a rich finish with a thick glossy table top to create this exciting contemporary designed furniture that is sure to awaken the style of any dining room decor. The subtle tapered leg design of the table is bathed in a dark brown finish that beautifully complements the thick gloss finished table top to flawlessly capture the contemporary flavor of this collection. With the beautifully stitched faux leather upholstered chairs, the “Naomi” dining room collection is a shining example of stunning contemporary design. The rich rustic design of the Bassello Dining Room Collection by Ashley Furniture at FurniturePick beautifully combines a variety of materials to create a furniture collection that is sure to enhance the atmosphere of any dining experience. The inviting rustic brown finish, flowing smoothly over the straight-line rustic design makes this rustic collection the exceptional choice for any dining room decor. The Bassello Dining Room Collection is sure to transform any home.